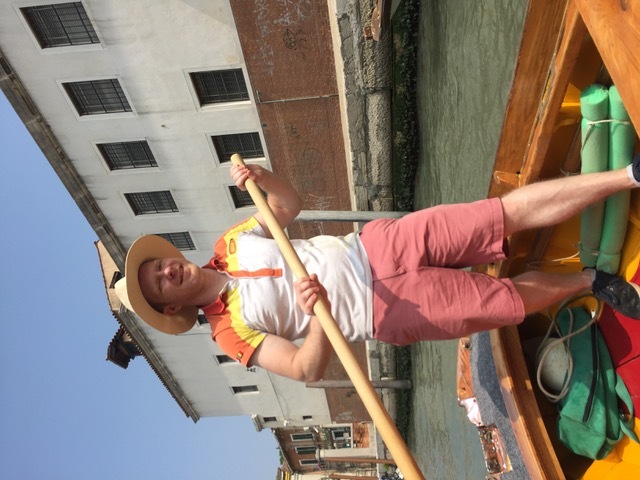 When I lived in Venice many years ago, although my days were filled with working on Venetian boats, I never really spent much time rowing them. 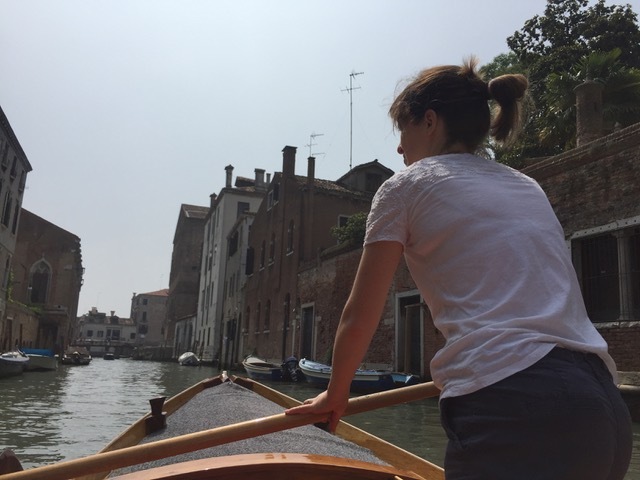 A recent invitation to a dear friend’s wedding meant a return to the lagoon with my wife, and a chance to indulge in an early morning rowing lesson and making the most of my cultural expansion grant! Veniceonboard.it is run by a couple of very talented young lads who’ve rejuvenated one of the last, if not THE last, free public boatyards. By offering space, knowledge of repairing wooden craft and practical lessons with sailing and rowing vessels, they have breathed new life into their section of Venice, Cannaregio. My wife and I were greeted by Nicola, who gave us a tour of the workshop and quizzed me on my knowledge of the gondola’s ferro. The front steel piece that adorns a gondola has a distinctive shape, representing elements of Venice. Each of the steel protrusions represent the neighbourhoods that make up Venice, the three ornate spindles are for each of the three bridges that cross the Grand Canal, the top arch is for the Doge’s hat (Doge being the historical ruling leader’s title), the interior arch for the Rialto bridge and the overall shape for the curve of the grand canal. But it should also be noted that as a hefty bit of steel it effectively counters the weight of the gondolier at the back and makes for one imposing hood ornament! Arriving from a pre-work morning row, Luigi moored up and welcomed us on-board a mascareta to set off for an hour-long lesson. 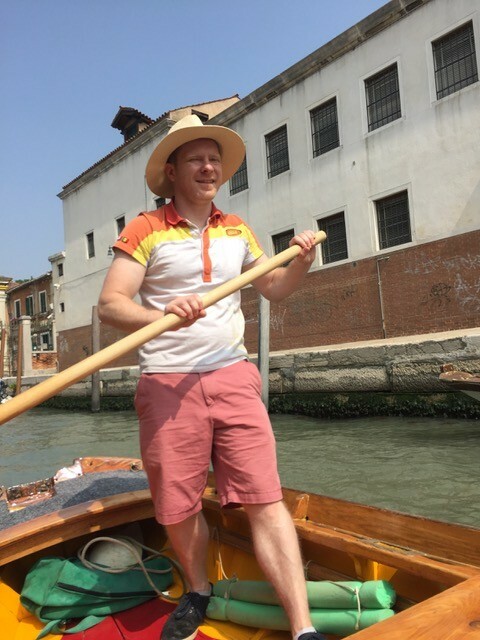 On the quiet canals on the extremities of Venice, away from commuter traffic and the busyness of the Grand Canal, we were able to try our hand at traditional Venetian rowing. A mascareta can be rowed by an individual but also by two, one at the bow and the other at the stern, on opposite sides of the boat. With Luigi at the stern primarily steering and correcting my movements, I was at the prua (bow) acting as the force to propel us forward. The oars have a bladed edge and the rowing motion didn’t take too long to get the hang of. Each oar is held by a forcola, whose curves are made with consideration for rowing positions, the boat it’s being used for, as well as the oarsman’s style. After my wife’s turn rowing at the prua, Luigi instructed me on rowing at the poppa (the stern). Rowing solo at the rear, you are both the force and direction. The oar remains in the water, creating a forward push to the right and a corrective yet slightly braking motion to the left. This mini wiggle pushes the boat forward. It’s important not to point the boat straight as you might do instinctively, but rather at a slight diagonal. This is because Venetian boats are designed without a keel for use in the lagoon, and the one sided rowing technique is essential for steering the flat bottom craft. Luigi was an exceptional teacher. In addition to his impeccable English, his instruction was the perfect balance of demonstration, correction and allowing you to discover through doing to understand how to adjust your motions. Returning to the boatyard, he and Nicola told us of their plans for a long distance trip to Croatia which would require more than a fair bit of sailing skill, and their upcoming visit to Cambridge as rowing instructors for a boatyard that has some Venetian craft. It was such a wonderful experience that I instantly began daydreaming how I might be able set myself up on the Orwell river with my own bit of Venice. I’ve got a stripy shirt, so that’s a start I guess!